When I was young, I learned that Santa came down the chimney to deliver our gifts. But the pragmatic me always wondered how he could squeeze through the narrow chimney, and how he kept himself sparkling clean. I forgot it was magic. 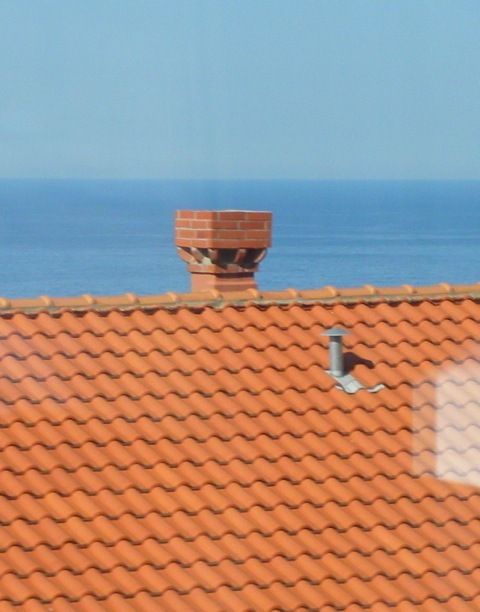 Later, when I travel, I enjoy looking at houses and their chimneys that reflect the countries’ cultures and traditions. 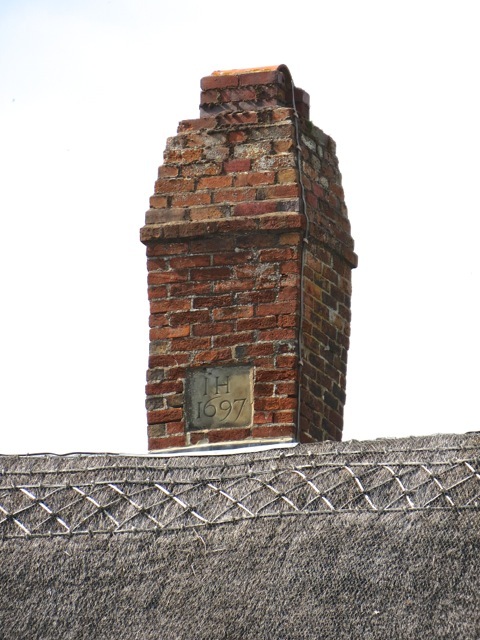 This 300 year old chimney over a thatched roof house in England was constructed in 1697. 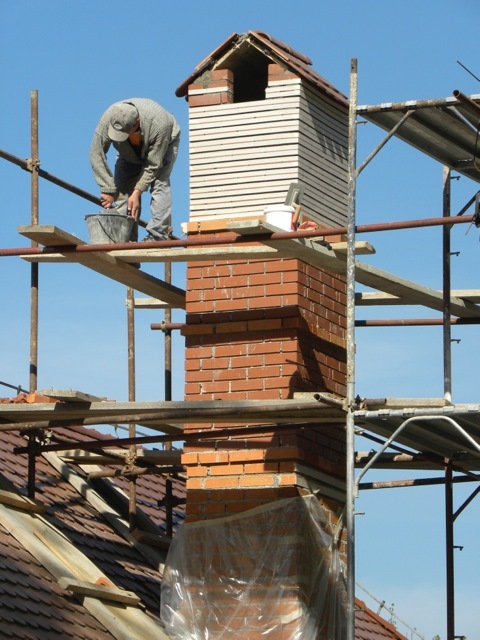 Chimneys have to be maintained. This chimney in Slovenia is being rebuilt. 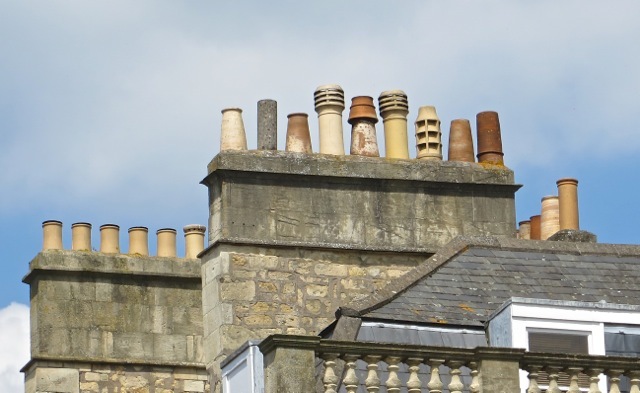 These chimneys in Bath, England, have eclectic styles sourced from diverse suppliers. 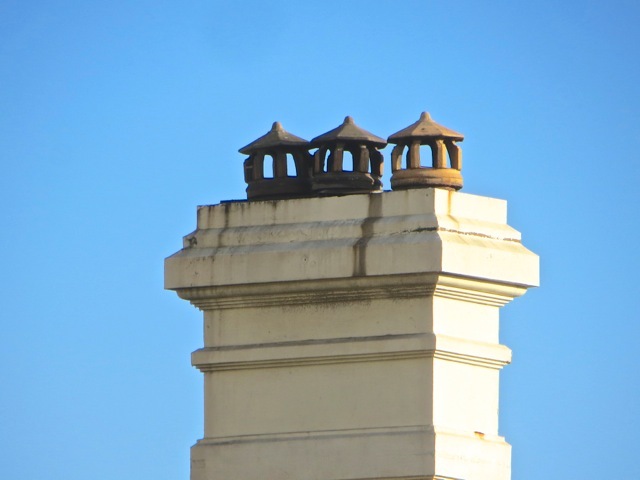 This chimney in San Francisco is capped with lacy decoration. 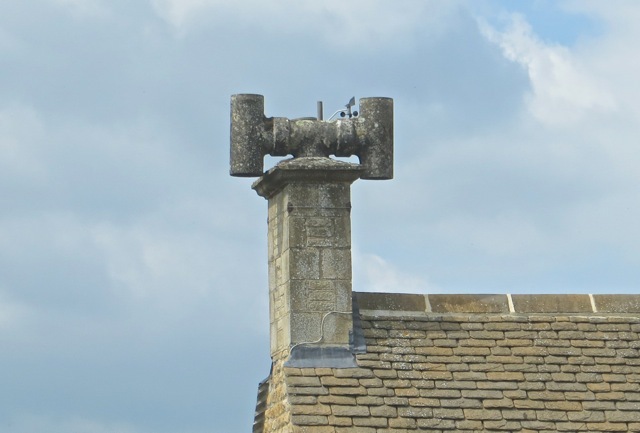 This down-to-earth house in Stow-on-the-Word, England, used 4-inch sewage pipes to construct an unique chimney. 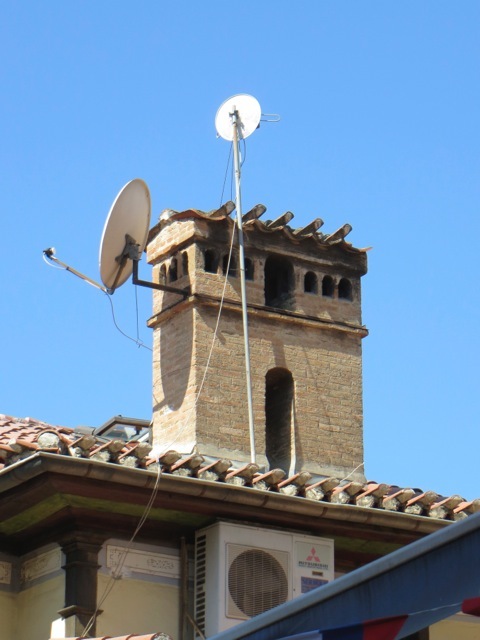 This chimney in Agvinon, France, is capped with an artistic head. 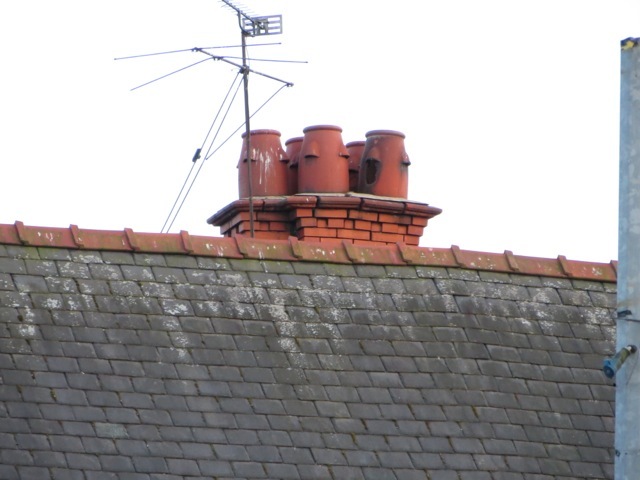 Many chimneys in Chester, England, are topped with urn-like cylinders. This chimney in San Francisco looks ordinary except it is straddled by a fire escape. Building fire code requires fire escape access to the ground as well to the roof. 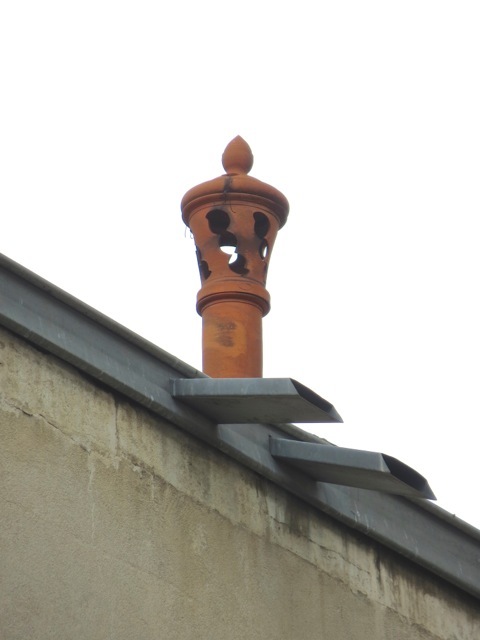 If a resident had to escape to the roof, he/she may escape from a fire and get roasted over a chimney. 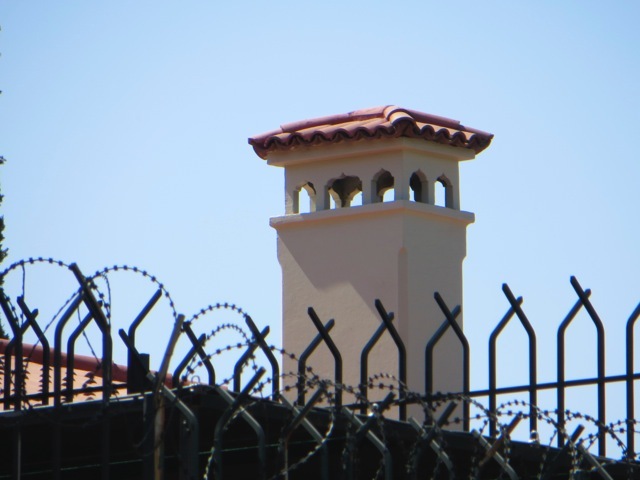 This well-protected compound in Turkey has a chimney built like an Arabic palace. 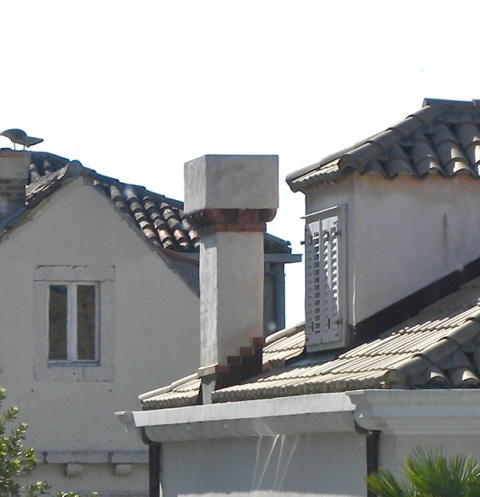 This chimney in Croatia looks like an old thatched roof brick house. 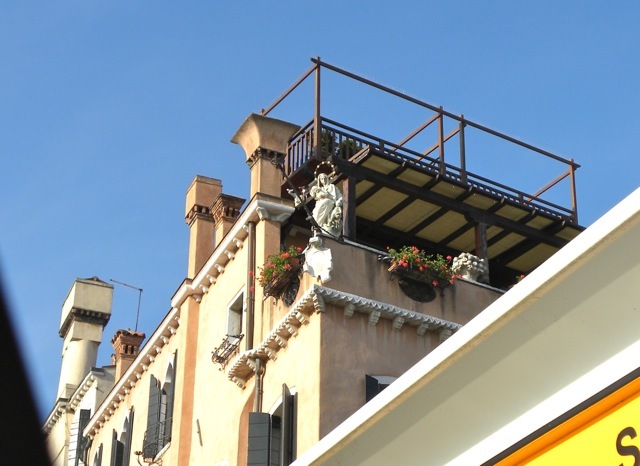 Venice houses are elaborately built. 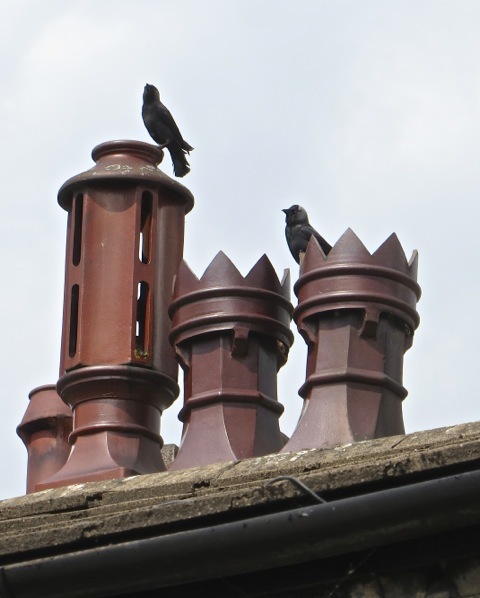 Their house-like chimneys reflect that opulence. 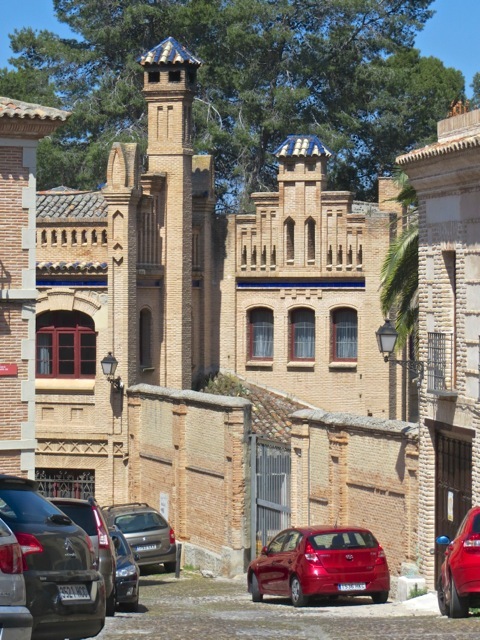 This mansion in Toledo, Spain, sports house-like chimneys with glazed tile roofs. 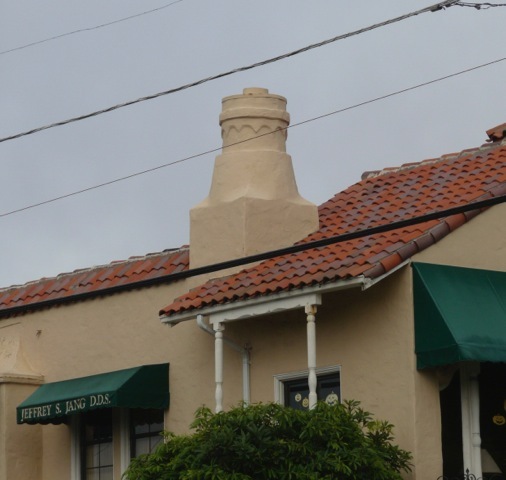 An institution in San Francisco features a Parthenon-like temple as its chimney. Castle towers and walls are often capped with protrusions called machicolation. They allow defenders drop stones through floor openings onto attackers below. 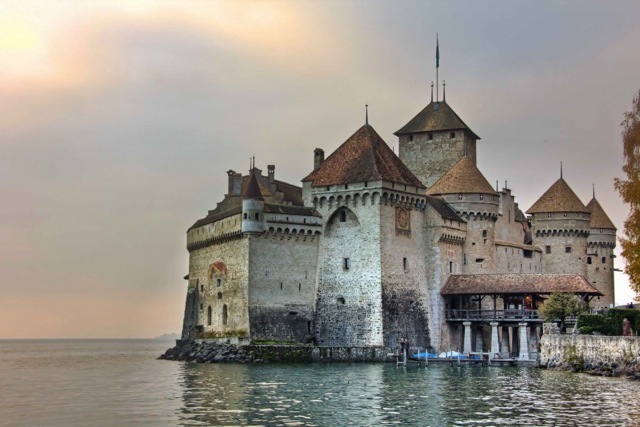 This Chillon Castle in Switzerland has machicolation on all its exterior towers. Kotor, Montenegro, is a well-fortified city. 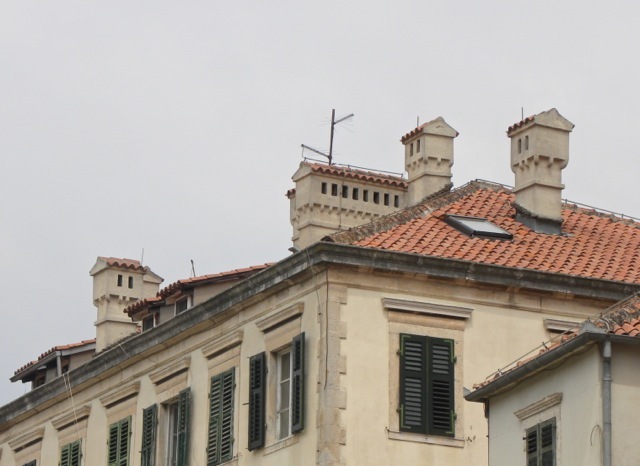 Houses in Kotor take pride in its defensive wall and built their chimneys to look like towers with machicolation. Dubrovnik is a beautiful and impregnable fortified town on the Adriatic coast. 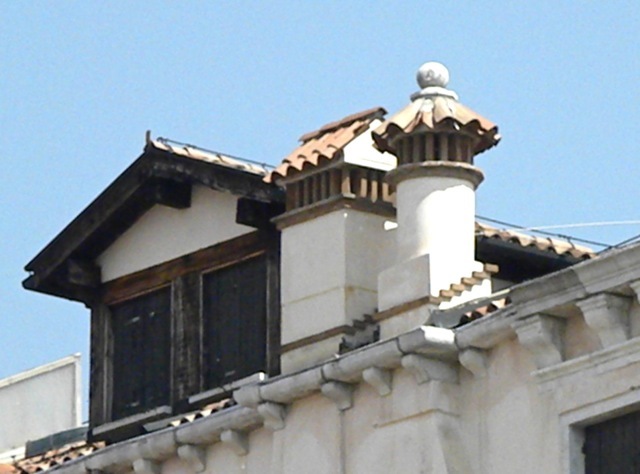 Many houses in its region feature chimneys that mimic machicolated towers. 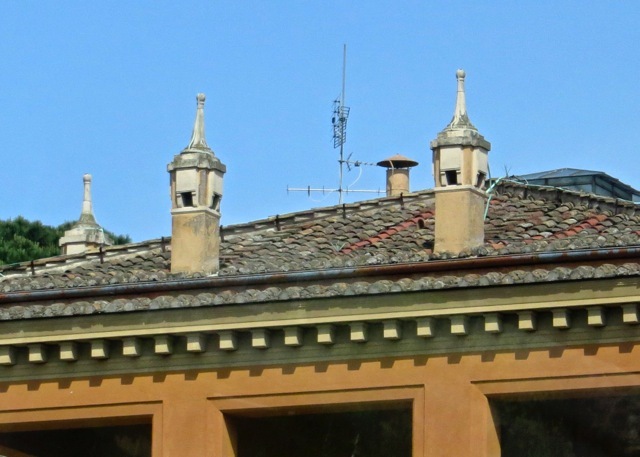 These Venice chimneys all have prominent machicolations. This chimney in Split, Croatia, is decorated with a stark, no-nonsense battle tower. 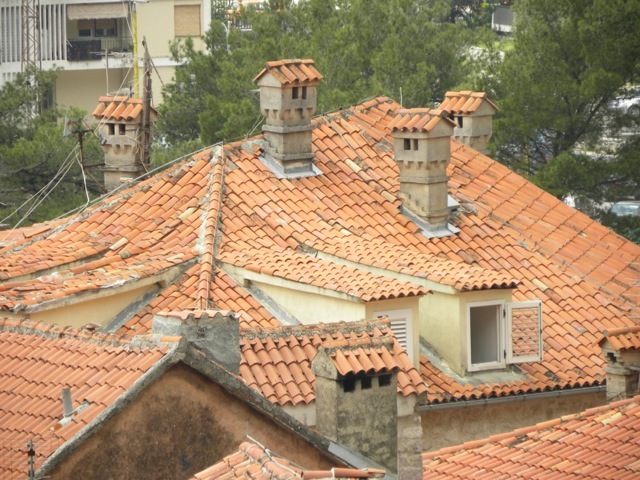 Almost every chimney in Kotor, Montenegro, is a fortified house. 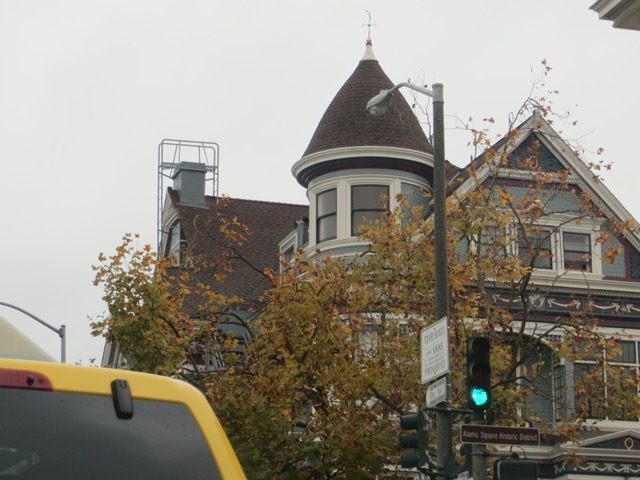 This house in San Francisco features a rough attempt of a machicolated tower for a chimney. These well-crafted royal towers in Chester, England, attract birds. Perhaps they enjoy the warmth of the chimney exhaust. 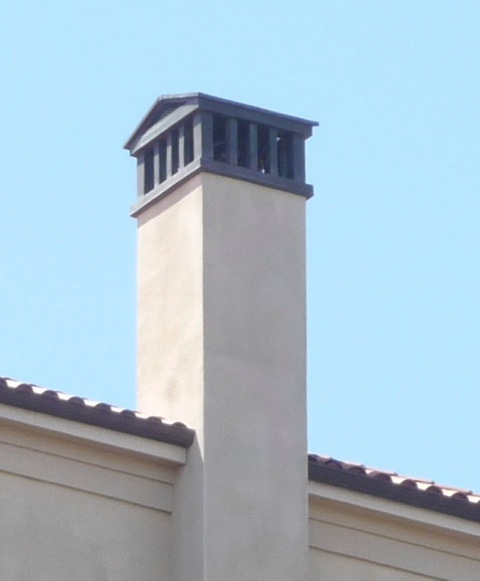 This Venice chimney has multiple openings. 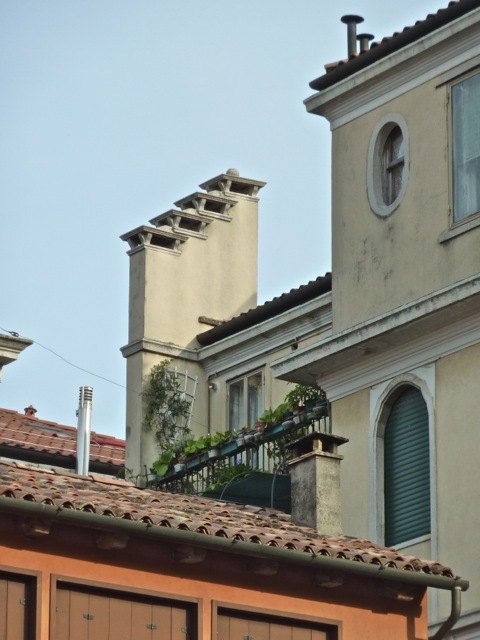 These houses in Venice have diverse chimney styles. 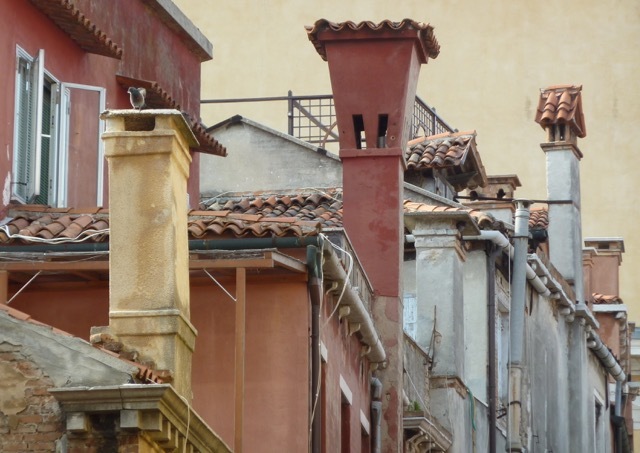 These Rome chimneys are elaborately designed. 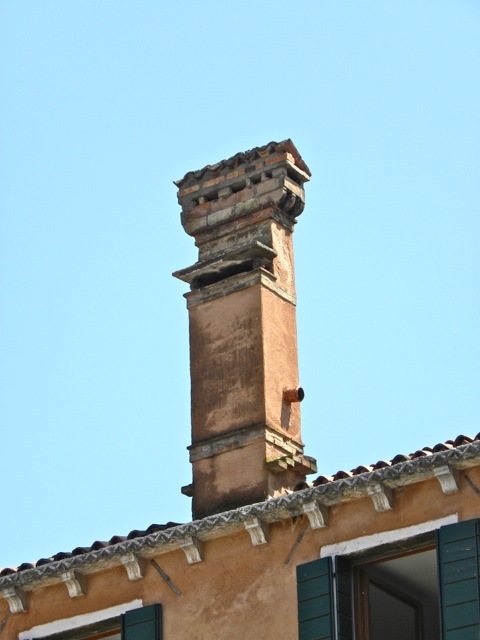 This Venice chimney is a neat compliment to the house. 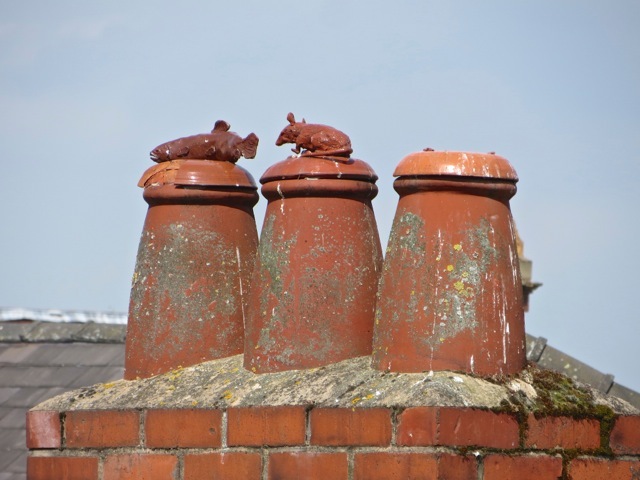 But the most fanciful chimneys are these I found in Chester, England. Posted by Robert Wu on Sunday, December 14, 2014, at 3:26 pm. Filed under Uncategorized. Follow any responses to this post with its comments RSS feed. You can post a comment or trackback from your blog.